Fusion Registry 9 Enterprise Edition is an integrated management system for aggregated statistical data and metadata. It uses SDMX, the international standard for describing and exchanging official statistics. SDMX provides a flexible and proven multi-dimensional information model designed specifically for statistics, meaning Fusion Registry 9 can be used for any statistical domain. Fusion Registry 9 Enterprise Edition provides a robust and proven solution for central banks, international organisations, and national statistics offices who need to report, collect, integrate, exchange and disseminate data using the SDMX standard. It is fully compliant with the standard ensuring seamless interoperability with other SDMX compliant services. For business analytics and econometrics, Fusion Registry 9 Enterprise Edition acts as a virtual statistical database for aggregated time series and cross-sectional statistics. Statistical data sets from multiple source systems, departments and operating units can be dynamically integrated in real time into Fusion Registry's virtual data repository. The repository provides data teams with a single consolidated source of reliable, validated and governed statistics. Fusion Registry 9 is designed around the standards and processes that governments and central banks use for managing their statistics making it open, non-proprietary and interoperable. 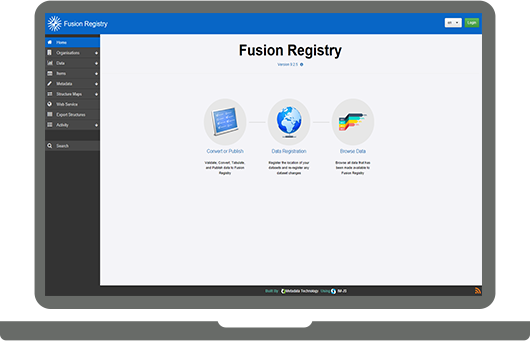 Fusion Registry 9 Enterprise Edition is available on annual subscription which provides license, updates, upgrades and support for a single yearly fee. The price is dependent on several factors including the number of production environments, the number of data sources or data providers, the level of support required and any use case specific configuration needed. The free-to-use Fusion Registry Community Edition may be suitable if your main requirements are data modelling, data conversion or data transformation. Find out more about Fusion Registry Community Edition and the other free to use SDMX Community Tools. Fusion Registry 9 Enterprise Edition is the product of 10 years of development by the consultants who developed the original SDMX standard. It’s in production use at central banks, international organisations and national statistics offices in Europe, the Middle East, America and Canada. Fusion Registry 9 Enterprise Edition supports the complete aggregated data lifecycle from collection and reporting through to dissemination. Fusion Registry 9 is built around the SDMX Information Model, so it’s SDMX to the core. SDMX is not just an input or output format, it is used as a model for data reporting, collection, dissemination and discovery. Fusion Registry 9 is fully compliant with the SDMX standard and supports all versions: 1.0, 2.0 and 2.1, plus EDI. Metadata Technology also acts as advisors to the SDMX Technical Working Group ensuring Fusion Registry is always at the forefront of the standard's development. Fusion Registry 9 closely integrates data collection, storage and dissemination with structural metadata management and reference metadata providing a closely integrated solution. Fusion Registry 9 is designed to deliver market-leading performance through innovations such as a unique SDMX optimised in-memory database. Fusion Registry 9 is highly scalable - the system can easily be scaled from a single instance running on a desktop PC to a multi-server load balanced architecture with multiple environments. Fusion Registry 9 has the deployment, resilience, integration and security capabilities needed to meet demanding mission critical use cases including auditing, load balancer support and Microsoft Active Directory integration. Fusion Registry 9 is actively developed and maintained with regular new-feature and maintenance releases. Fusion Registry 9 can easily be deployed in the cloud. Users need only a standard web browser so it’s easy to access, easy to deploy and easy to secure. SDMX (Statistical Data and Metadata Exchange) is a mature, proven and open standard designed specifically for describing and sharing statistical information. Launched in 2001, SDMX is sponsored by seven international organisations (BIS, ECB, Eurostat,IMF, OECD, UN and the World Bank) and who lead a programme of active development to keep the standard up to date. In 2013, SDMX was adopted as an ISO International Standard (ISO 17369:2013). Fusion Registry 9 Enterprise Edition provides a complete integrated solution incorporating structural metadata management, data validation, data transformation, data collection, data dissemination and reference metadata. A range of enterprise deployment features and options are provided including auditing, Microsoft Active Directory support and load-balancer support. Fusion Reporting Node simplifies and automates the reporting process where data collecting organisations need to collect data in SDMX format from multiple distributed providers. Fusion Edge Server is a dissemination edge server that can be deployed in load balanced clusters and across multiple geographic regions. The Fusion Registry 9 will integrate statistical data from any number of local and remote sources into a single virtual data repository. Fusion Registry has the concept of data sources which include Registry managed local storage into which data can be loaded using the user interface or REST API, other local SQL databases containing pre-prepared data, and remote file and web services referenced by URL. When a new data source is registered, the data are indexed but kept at source and only retrieved on demand. The approach avoids duplicating data that may never be used and ensures data is always up to date. To maximise query performance, caching is used on both the server and client sides. To respond to a query on a particular data set, Fusion Registry's virtualisation engine retrieves and integrates the data required in real time from potentially multiple data sources. Consider querying for pan-European 'employment' data where the data comes from separate data sources managed by each country. Fusion Registry 9 supports MySQL, SQL Server or Oracle databases for local storage. Alternatively, for datasets less than 100 million observations, Metadata Technology's SDMX optimised persistent in-memory database is simple to configure and delivers the best query performance. Fusion Reporting Node acts as a connector for dynamically integrating remote data sources into Fusion Registry's Virtual Data Repository - specifically flat files (Excel, CSV and SDMX) that are not accessible by URL and private databases. Its main use case as illustrated in the diagram, is to automate data collection from multiple reporters. © 2019 Metadata Technology Ltd. All Rights Reserved.